Tech N9ne and select artists on Strange Music are gearing up for the largest national tour of their professional careers. This highly anticipated tour, Tech’s first since last year’s Independent Grind Tour, spans over 65 shows from coast-to-coast and is sure to be in a city near you. We want to know which city is the most excited for this tour! Each week we will be taking calls from select cities for you to boast why your city is a “Tech N9ne Town”. Here’s your chance to call in and talk about which artists you are the most excited to watch live in concert, talk about what you enjoy doing or going to before or after the show, and anything else that you want to share with the world as to why your city reps STRANGE the hardest. Call in Monday, April 25 at 1PM CST: (347) 994-3066! It’s going DOWN at The Wilma Theater in Missoula, Montana! Last time we stopped by for The Independent Grind Tour, some said that the show even exceeded their expectations. Maybe it’s kicking it in the great outdoors that gets the artists going. Who knows? 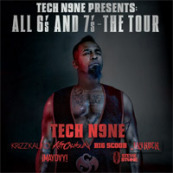 One thing is for sure, Missoula always knows how to party when Strange Music comes through, and this time for All 6’s and 7’s–The Tour, it’s going to be the biggest party yet! It’s going to be a live one at the Wilma Theater on May 31, 2011, so make sure you get your tickets while they’re still available! Have you got your VIP package yet? What are you waiting for!? Click here to order yours today! Also remember to call in at (347) 994-3066 at 1PM CST to represent and tell us why Missoula is THE Tech N9ne Town! Do you think Billings could be left out of the argument for holding it down as Tech N9ne Town Number One!? What are you on!? Last time Strange Music came through Billings for the Independent Grind Tour, Big Scoob said it was one of the top five crowds of the tour! This time around they’ll be throwing down at the Babcock Theatre on June 1, 2011. Don’t forget to get your tickets today and also reserve those VIP packages! Some say that Montana is officially a Strange State, let’s make sure they don’t forget! Call (347) 994-3066 at 1PM CST to represent and tell us why Billings, Montana holds it down the most! Does this really need an explanation? This is only the city that Tech N9ne has people screaming around the world: “KC, MO, ROLLLLLLL!” This year Tech’s doing it BIG at The Midland Theatre on June 3, 2011. For fans the WORLD over, this is a can’t-miss show, as Tech holds it down for his hometown in the finest indoor theatre in the city! If you thought the shows before were epic, just wait until The Midland gets Strange! Get your tickets NOW and your VIP packages while they’re still available. Call (347) 994-3066 at 1PM CST to represent for the city where it all started: Kansas City! The biggest city in Kansas always comes out to celebrate whenever Strange rolls into their town! It’s going to be poppin’ at The Cotillion on June 8, 2011! Last time Tech and them came through Wichita the response was nothing but propers all around! What’s it going to be like this year? Our guess: another showing of great music and hip hop that’ll leave the crowd at The Cotillion breathless! Make sure to get your tickets and VIP packages while they’re still available for this “Midwest Explosion“! Does Wichita hold it down the most? Call (347) 994-3066 at 1PM CST to tell us why! Fans in Missoula, Billings, Kansas City, and Wichita: we will be accepting your calls on our live radio broadcast on Monday, April 5 to hear you out! Call in and let us know why you think your town is ready for All 6’s And 7’s Tour! VIP packages for TECH N9NE PRESENTS: ALL 6’S AND 7’S – THE TOUR are available now by clicking here. These packages, valued at over $300, include your ticket to the show, incredible merchandise items and a one hour Meet And Greet with all of the artists on the tour. Don’t miss your chance to get the full 6’s And 7’s experience. Order your VIP package today and get set for a summer concert experience like no other.